I could be posting this in the wrong part of the forum.. But anyway here it is. 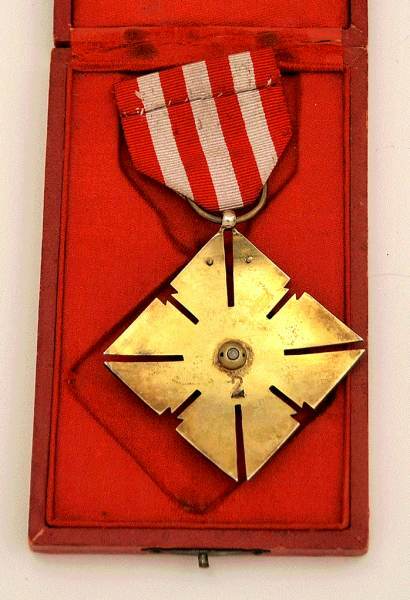 Can somebody Id this award? The pic is poor as it's from a crappy quality .pdf. Thanks for your time! Certainly Chinese with seal script characters but what I have no idea. It is also listed as unknown there... but what a coincidence that this pops up twice now! do you have a picture of the medals backside? Would suspect that the one in Stabouli's sale is 3rd class, Kim's is 2nd class and if we find an example with 3 stars that will be first class. Thanks for the input gentlemen. Sorry, but this is the only pic I have. It's from an auction house catalog and also listed as unknown, possibly Chinese. This is the Chinese ''Four Fundamental Virtues of the State Award'', second class. Ref. Medal Collector, November ... 1968. Mr J.W. Peterson. (These four virtues (Szu wei) are : Courtesy, Justice, Moral integrity and Decency). 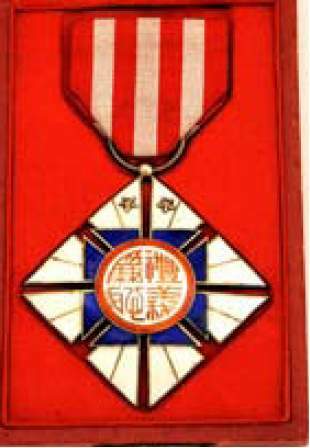 Such award was given to the French aviator Fieschi, late in the thirties or early in the forties , at the occasion of long distance flights from France to China, and services done as instructor in the Chinese air force. Once again big thank you Cussonneau! A total aside, but Fieschi flew with SPA80 in the First World War, along with my first cousin once removed, Adjt. Antonin Gautier. They collided during a dogfight; Antonin was killed.